Need to curb iPhone addiction or force yourself to focus? Here's how to do it. At the end of each week, you’ll get an automatic report detailing how often you or your child used the device, as well as the percentage of time spent on apps with specific categories, such as Social Networking, Games, Entertainment, and Productivity. Alternatively, you can get current information about these stats by visiting Screen Time at any time. With that information, you’ll have a better idea of where you need to place limits. Regardless of how you want to use it, here’s how it works. 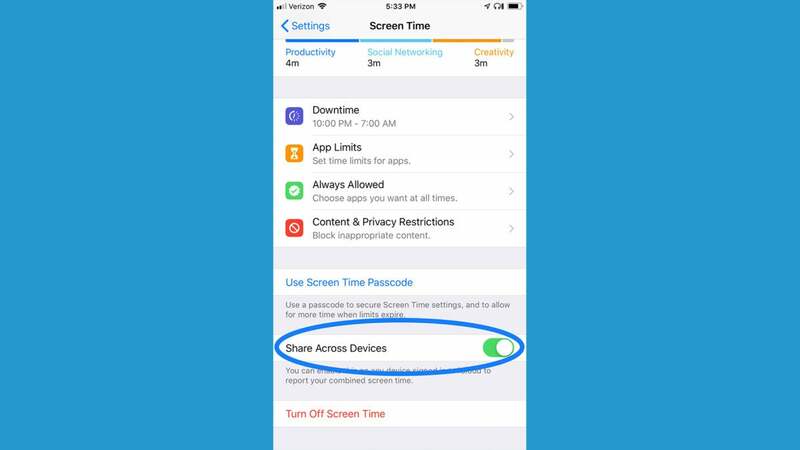 Scroll to Screen Time, which you’ll find alongside Do Not Disturb. Fortunately, it isn’t that far down. 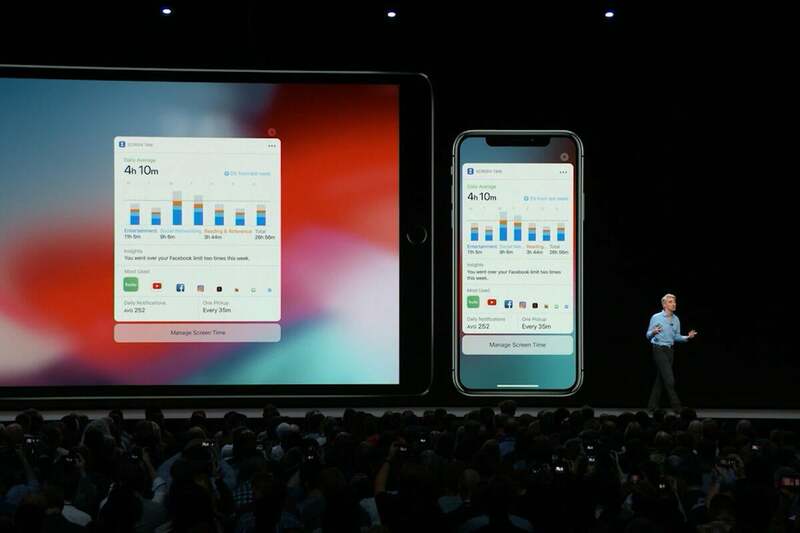 If you didn’t choose to turn on Screen Time while setting up iOS 12, here’s where you’ll have a chance to do so. (When you do, a Screen Time widget will appear in the widget list when swipe right while your iPhone screen is locked.) 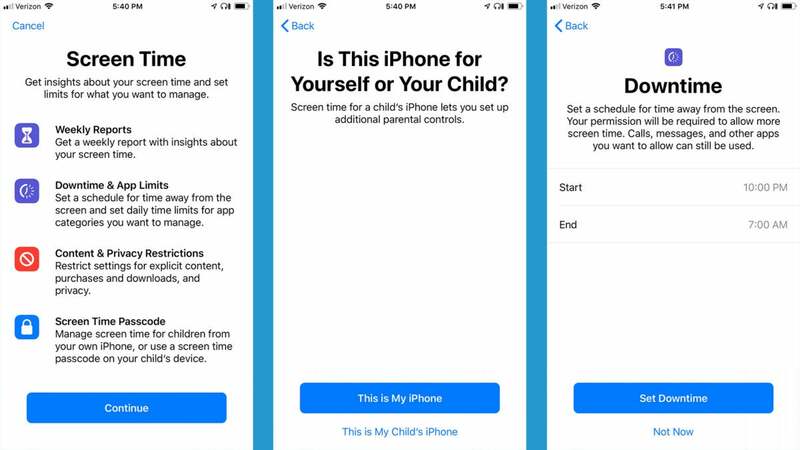 Also, the app will ask you if the device you’re holding is your phone or that of your child’s. If you’re setting up your child’s phone, you’ll have the option to set up the various restrictions immediately. Downtime: Much like setting up Bedtime Mode in Do Not Disturb, Downtime effectively shuts down your phone for a specific length of time, allowing access only to calls and apps you greenlight. You simply choose a start time and an end time, which is useful if you want to restrict your child’s access at bedtime or during family time. 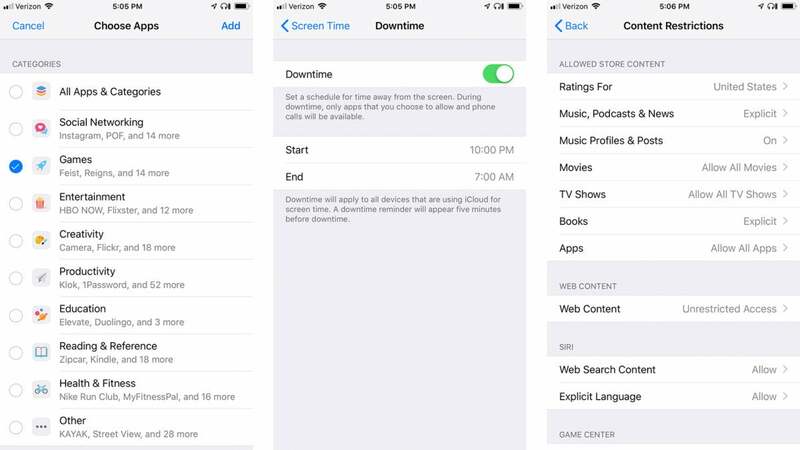 App Limits: App Limits is a little more complex in that it lets you restrict access to apps in certain categories for a specific set of time per day. If you want to restrict how often a child uses games, for instance, you’d click Add Limit in the App Limit screen, go to Games, click Add in the upper right corner, and then choose how many hours you’d like to restrict their usage to for the day. Always Allowed: You can make exceptions for the above rules with Always Allowed. By default, Phone, Messages, FaceTime, and Apple Maps are enabled (and you can disable all of them except Phone), but if you scroll down, you can easily choose other apps to add to this list. Content & Privacy Restrictions: These are the deep cuts, and it's the most complex section of Screen Time by far. There are a ton of options, but for children, you’ll probably be best served by clicking on Content Restrictions and tinkering with the ratings allowed. Under Movies, for instance, you can select PG-13 as the high end. With that restriction in place, movies rated R and NC-17 will be inaccessible. Impressively, you can set the specific ratings for a wide variety of countries. All these restrictions barely mean anything if your kid is bright enough to simply wander into settings and turn them off. Fortunately, Apple allows you to make a separate four-digit passcode for Screen Time. 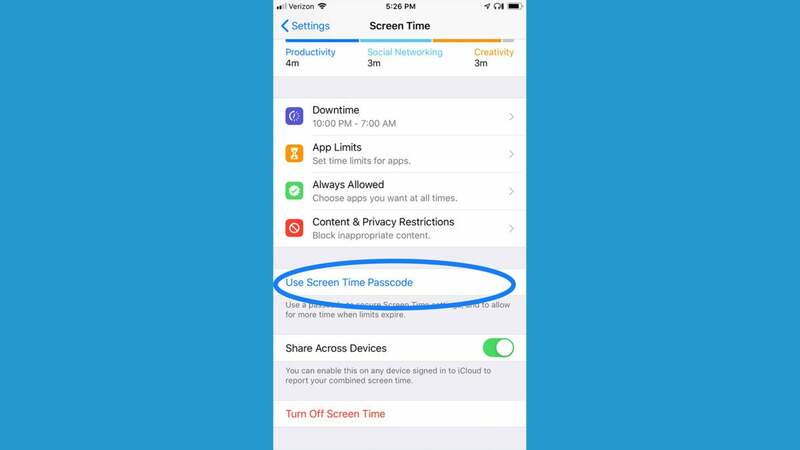 Scroll down to Screen Time Passcode. Enter a four-digit code, and then re-enter it for security and accuracy. Whenever you try to alter a setting in Screen Time, you’ll have to enter this code. To disable the code, simply repeat the steps above, and you’ll find that Screen Time Passcode has changed to Change Screen Time Password. Press it, and you can either change the passcode or disable it entirely. 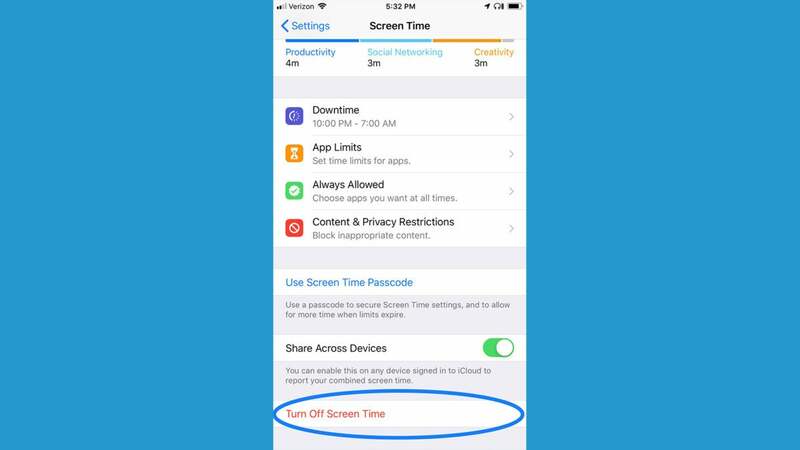 By default, Screen Time only focuses on the iPhone or iPad you’re currently using. Fortunately, it’s relatively easy to include other devices in the report, such as those for your children. Scroll down to Share Across Devices, located near the bottom. Click on the toggle, flipping the switch to green. At the top of your Screen Time home panel, the top line should now read All Devices. Click on it. You’ll see a report for both today and the last seven days for every device tied to the account. Select the specific device you’d like to see information for, and the report will change to focus on its usage alone. Control is good, but sometimes you wanna be free, you know? And fortunately, you can shake off the restrictions and go back to your binge-watching ways relatively easily. Scroll all the way down to Turn Off Screen Time, which is in red letters. Provided you don’t have a passcode active, that’s it. You’re free.